Tackfix 48 is the fastest, strongest hot melt system available for flooring use and out-performs all competitors. It is non-toxic and has been specially formulated to run well in any glue gun. Tackfix 48 glue sticks maximize glue gun output per trigger pull which allows for use on larger or longer applications. Tackfix 48 glue sticks will remain stable in high heat environments or if the glue gun is left on without use. 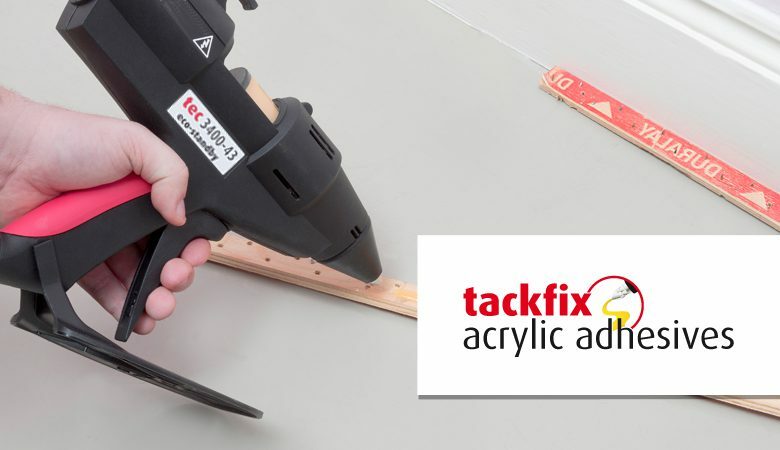 Tackfix 48 is a fast and easy alternative to nailing down carpet tack strips, laying tiles and hardwood flooring starter strips. Apply the adhesive to one surface with our industrial glue guns and press the parts together for an instant bond. Carpets can be stretched within minutes of laying gripper, tiles can be secured instantly without fear of movement, or simply use the adhesive as an extra pair of hands on countless flooring and construction applications. These are not your average clear glue sticks! Experience how Power Adhesives industrial hot melt adhesives can make your job easier!